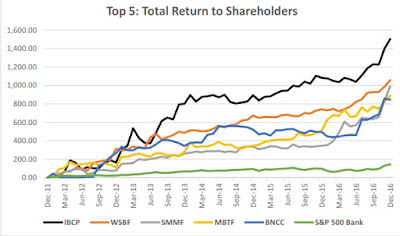 For the past five years I searched for the Top 5 financial institutions in five-year total return to shareholders because I grew weary of the persistent "get big or get out" mentality of many bankers and industry pundits. If their platitudes about scale and all that goes with it are correct, then the largest FIs should logically demonstrate better shareholder returns. Right? Not so over the five years I have been keeping track. 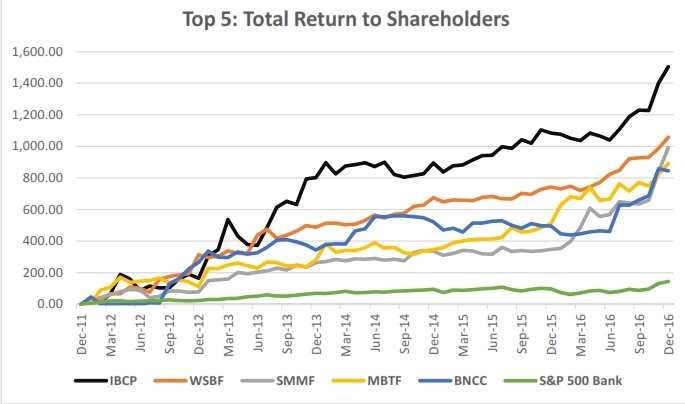 My method was to search for the best banks based on total return to shareholders over the past five years. I chose five years because banks that focus on year over year returns tend to cut strategic investments come budget time, which hurts their market position, earnings power, and future relevance than those that make those investments. Total return includes two components: capital appreciation and dividends. However, to exclude trading inefficiencies associated with illiquidity, I filtered for those FIs that trade over 1,000 shares per day. This, naturally, eliminated many of the smaller, illiquid FIs. I also filtered for anomalies that result from recent mutual-to-stock conversions and penny stocks. Independent Bank Corporation celebrates its second straight Top 5 recognition, and BNCCORP celebrates its third straight year on this august list. Congratulations to them. A summary of the banks, their stories, and links to their website are below. Independent Bank dates back to 1864 as the First National Bank of Iona. Its size today, at $2.5 billion in assets, is smaller than it was a decade ago. It is a turnaround story because the bank was hammered with credit problems between 2008-11, when it lost over $200 million. In 2011, at the height of its problems, non-performing assets/assets was nine percent. Today that number is 3.6%. Exclude performing restructured loans, and that number plummets to 0.62%. The result: those investors that jumped onboard at the end of 2011 were well rewarded. Their total return was greater than 1,500%. You read it right. Waterstone is a single-bank holding company headquartered in Wauwatosa, Wisconsin. It has $1.8 billion of assets and operates eleven branches in the metropolitan Milwaukee market, a loan production office (LPO) in Minneapolis, Minnesota, and 45 mortgage banking offices in 21 states. The mortgage bank has more than 3x the employees of the bank. Year-to-date, the company has generated more fee income, at $95.2 million, than it has in operating expense, at $95.0 million. I don't know any other bank that accomplished this. I'm sure there are some. But I haven't heard the tale. This tale is true. That means their year-to-date $31.8 million net interest income after provision... is gravy. And that is a key reason why their five-year total return exceeded 1,000%! Summit Financial Group, Inc. is a $1.7 billion in asset company headquartered in West Virginia, providing community banking services primarily in the Eastern Panhandle and South Central regions of the state, and the Northern and Shenandoah Valley regions of Virginia. Summit also operates an insurance subsidiary. In 2011, the company had net income of $4.1 million on assets of $1.5 billion. Today, the company has annualized net income of $16.8 million. A reversal of fortune from a 0.28% ROA to a 1.09%. How did they do it, from my perspective? 1: Margin expansion, and 2: Expense discipline. Annual operating expenses were $36.6 million in 2011, and are $33.2 million today. And that includes some of the expenses associated with an acquisition that is set to close shortly. So they grew. And spent less to do it. A bank that viewed its operating expenditures as investments. Amazing! In 1858, while Lincoln and Douglas debated for a US Senate seat, Benjamin Dansard started Dansard State Bank to operate from the back of Dansard General Store. Ultimately renamed Monroe Bank and Trust, this bank pre-dates the Civil War! Similar to IBCP above, MBT is a turnaround story. In 2011, non-performing assets/assets was at 7.7%. Today they are at 1.8%, and below 1% if you exclude restructured yet performing loans. The asset quality issues led to a $3.8 million loss in 2011. Since that time, nothing but black ink, leading to a year-to-date ROA of 1.10%, and ROE of 10.13%. How did they get there? A dramatic improvement in asset quality, a process and efficiency initiative that led to reduced costs and improved processes, and motivation. Insiders own over 22% of the company. That's motivation! Well done! BNCCORP, Inc., through its subsidiary BNC National Bank, offers community banking and wealth management services in Arizona, Minnesota, and North Dakota from 16 locations. It also conducts mortgage banking from 12 offices in Illinois, Kansas, Nebraska, Missouri, Minnesota, Arizona, and North Dakota. BNC suffered significant credit woes during 2008-09 which led to material losses in '09-10, and the decline in their tangible book value to $5.09/share at the end of 2010. Growth, supported by the oil boom in North Dakota's Bakken formation, and a robust mortgage banking business, is challenged due to the decrease in oil and ag commodity prices. But earnings continue to increase in spite of the challenges. This has resulted in a tangible book value per share at September 30th of $22.51... a significant recovery and turnaround story that landed BNC in our top 5 for the third straight year. Your investment five years ago would have resulted in over an 800% total return! Here's how total return looks for you chart geeks, with the lower green, and flat line being the S&P 500 Bank Index. There you have it! The JFB all stars in top 5, five-year total return. The largest of the lot is $2.5 billion in total assets. No SIFI banks on the list. Ask your investment banker why this is so. Congratulations to all of the above that developed a specific strategy and is clearly executing well. Your shareholders have been rewarded!